Brian was born and raised in Sparta, Michigan. He graduated from Sparta High School in 1979. He attended the Grand Rapids School of the Bible and Music and graduated in 1984 with a specialty in Pastoral studies. He also studied at Bethany Bible and Seminary and graduated with a Bachelor of Arts Degree in Religious Education (BRE) and later received his Master's degree in Religious Education (MRE) in 1997. Brian married Karen Ruth in 1985 and has twin daughters, Kaitlyn and Nicole, who were born in September 1989. Brian worked as youth pastor, athletic director, Bible teacher, and basketball coach at the First Baptist Church in Carson City from 1987 until 1992. Being a Youth Pastor for several years, Brian connected with youth throughout the community in many different ways. He coordinated many mission trips, youth conferences, camping trips, and youth functions. He has served as basketball and softball coach to several teams in the area. He also served as Youth Coordinator at Central Michigan Youth for Christ before accepting a full time position as Pastor at New Haven Church of the Brethren in 1995. Brian feels strongly that the mission of our church is to reach lost souls for Jesus Christ and to become active followers of Christ. He believes that our church is much like the body of Christ - all of the members are needed and important to fulfill this mission. We must work together, each person contributing toward growth, maturity and unity. In Matthew 5:13-16 in the Sermon on the Mount, Jesus speaks of the church as "the salt of the earth" and "the light of the world." It is our hope that our church can be a light to those who are searching for answers and to bring others into the hope found only by giving their hearts to Jesus Christ. Kyle Trefil is our Youth Pastor here at New Haven Church of the Brethren. He currently lives just outside of Perrinton, MI with his wife Kaitlyn. He became the Youth Pastor on August 1, 2013. Kyle accepted Jesus Christ as his Lord and Savior back when he was 13 years old. 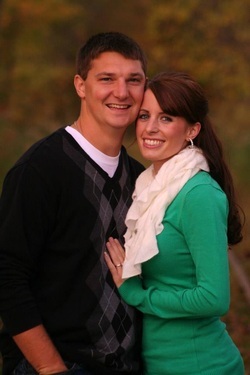 Kyle is a graduate of Fulton High School and Michigan State University with a degree in youth counseling.